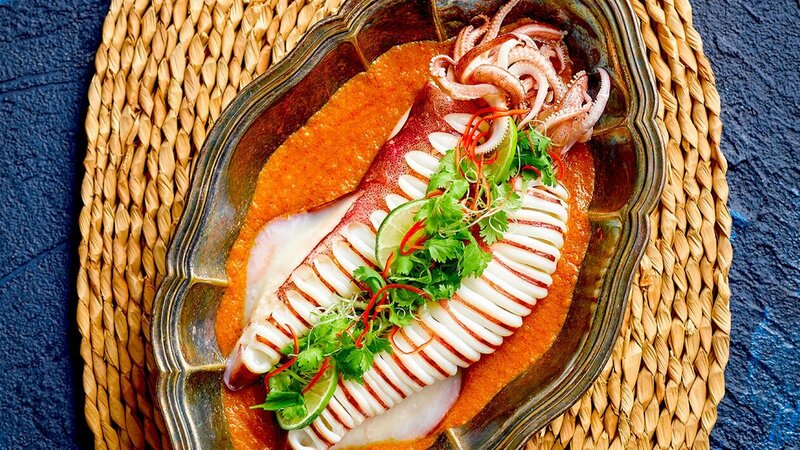 Unmistakable Peranakan flavours liven up fresh squid to whet the appetite perfectly. Ginger, shrimp paste, chilli and a variety of fragrant spices are what makes this dish so unique. In a blender, blend all ingredients till smooth. In a pot, sweat Nonya spice blend*, Knorr South East Asian Spice Paste and lime leaves till fragrant. Fold in pineapple puree, sugar, tamarind sauce and bring to boil. In a pot, boil Nonya paste† and water. Fold in tomatoes into Nonya sauce. Preheat steamer and steam squid for 3mins. Plate squid and pour sauce over.